Induced secretion of acute-phase serum amyloid A (SAA) is a host response to danger signals and a clinical indication of inflammation. The biological functions of SAA in inflammation have not been fully defined, although recent reports indicate that SAA induces proinflammatory cytokine expression. We now show that TLR2 is a functional receptor for SAA. HeLa cells expressing TLR2 responded to SAA with potent activation of NF-κB, which was enhanced by TLR1 expression and blocked by the Toll/IL-1 receptor/resistance (TIR) deletion mutants of TLR1, TLR2, and TLR6. SAA stimulation led to increased phosphorylation of MAPKs and accelerated IκBα degradation in TLR2-HeLa cells, and results from a solid-phase binding assay showed SAA interaction with the ectodomain of TLR2. Selective reduction of SAA-induced gene expression was observed in tlr2−/− mouse macrophages compared with wild-type cells. These results suggest a potential role for SAA in inflammatory diseases through activation of TLR2. The acute-phase response is a systemic reaction to infection and noninfectious insults and protects host by isolating pathogens, minimizing tissue damage, and promoting healing or adaptation to noxious stimuli (1). It is presumed that these functions are mediated through a set of proteins collectively termed acute-phase proteins. Hepatic production of serum amyloid A (SAA)3 (2), a major acute-phase protein, is responsible for the rapid increase in its plasma concentration by up to 1,000-fold within 48 h (2, 3). In addition to hepatic SAA synthesis, macrophages and fibroblast-like synoviocytes also produce SAA (4, 5, 6, 7). Clinical studies have identified numerous cases in which SAA production correlates with the severity of inflammatory diseases. Increased SAA production is found in atherosclerosis (8, 9), rheumatoid arthritis (10, 11), and Crohn’s disease (12). Besides the established function of SAA in cholesterol transport (13), SAA is chemotactic for neutrophils (14) and stimulates the production of tissue-degrading enzymes (15, 16) and proinflammatory cytokines (17, 18, 19). These findings support the emerging concept that SAA is a key inflammatory mediator and call for further investigation into the mechanisms of its action. Several proteins have been identified as SAA receptors that mediate its various functions. Notably, the G protein-coupled formyl peptide receptor like-1 (FPRL1) is responsible for the chemotactic activity of SAA (20) and for some of the cytokine induction effects of SAA (19, 21, 22). The scavenger receptor SR-BI mediates the cholesterol efflux function of SAA (23) and can transduce signals leading to MAPK activation (24). These receptors are not known as primary cytokine receptors and cannot fully account for the potent cytokine-inducing activity of SAA. In recent studies, we found that SAA is an endogenous ligand that stimulates IL-23 expression (25). Moreover, SAA induces G-CSF secretion and causes granulocytosis in mice, an effect inhibited by an anti-TLR2 Ab (26). These findings prompted an investigation of TLR2 as a potential receptor for SAA. Two types of SAA were used in this study: recombinant human SAA1 (SAA) from PeproTech, and human SAA1 fused to the Fc fragment of mouse Ig (SAA-Fc) as described below. Functional grade anti-TLR1, anti-TLR2, anti-TLR4, and anti-TLR6 and their isotype control IgG were from eBioscience. The anti-phospho-MAPK Abs were obtained from Cell Signaling Technologies. The anti-TLR2, anti-TLR4, and anti-SAA Abs for Western blotting were purchased from Santa Cruz Biotechnology. LPS from Escherichia coli 0111:B4 was obtained from Calbiochem. Purified lipoteichoic acids (LTA) from Staphylococcus aureus and peptidoglycans (PGN) from E. coli 0111:B4 were purchase from InvivoGen. The cDNA constructs for human TLR1, TLR2, TLR4, and TLR6 and their ΔTIR mutants were generated by PCR and cloned into the pUNO vector (InvivoGen). TLR2-HeLa cells were generated by transfection of HeLa cells with the expression construct pUNO-hTLR2 (InvivoGen). Stable transfectants were selected with 20 μg/ml blasticidin for 2 wk. Mock-transfected HeLa cells were generated with the empty vector. SAA-induced expression of a NF-κB-directed luciferase reporter was conducted as described (19). TLR2-HeLa cells were stimulated with either recombinant SAA from PeproTech or SAA-Fc purified from transfected Chinese hamster ovary (CHO) cells. All luciferase assays were performed with a 5-h stimulation. Data were normalized against β-galactosidase activity. CHO cells were transfected with an expression construct in the pFuse-Fc vector (InvivoGen) consisting of the complete coding sequence of human SAA1 and the Fc region of mouse IgG2 to facilitate secretion into the culture medium. The N-terminal deletion mutants of human SAA1 were generated by overlap PCR using a full-length hSAA1 cDNA and cloned into the pFuse-Fc vector. Transfected cells were selected by Zeocin (200 μg/ml; Invitrogen) and maintained in serum-free CHO-S-SFM II medium (Invitrogen). The TLR2-Fc fusion protein was generated such that the N-terminal 588 aa of human TLR2 were fused in-frame to the Fc portion of mouse IgG2a. The TLR2-Fc fusion protein was purified from the cell culture supernatant by standard protein G affinity chromatography and eluted with 0.1 M glycine. A similar Fc fusion protein encoding the ectodomain of human TLR4, TLR4-Fc, was generated and used as a control in the binding assay. The CHO culture medium was concentrated using Centricon cartridges. The Fc protein concentration was determined with ELISA. For SAA binding assay, high-binding enzyme immunoassay/radioimmunoassay plates (Corning) were coated with increasing concentrations of recombinant SAA from PeproTech, (S)-[2,3-bis(palmitoyloxy)-(2-RS)-propyl]-N-palmitoyl-(R)-Cys-(S)-Ser-(S)-Lys4-OH, 3HCl (Pam3CSK4), or LPS from E. coli strain 0111:B4 overnight at 4°C, and blocked with 1% BSA in PBS for 1 h before incubation with 2 μg/ml TLR2-Fc fusion protein for immunoadhesion. After three washes with PBS containing 0.1% Tween 20, a HRP-conjugated goat anti-mouse Ab (Calbiochem) was used for the detection of captured TLR2-Fc. Binding of the immobilized LPS by TLR4-Fc was conducted similarly. The TLR2 knockout mice (tlr2 −/−; B6.129-Tlr2tm1Kir/J) were obtained from The Jackson Laboratory. Bone marrow-derived macrophages from tlr2−/− and wild-type C57BL/6 mice (1 × 107 cells/sample) were stimulated with 1 μM SAA. Total RNA was prepared after the indicated time of stimulation. Real-time PCR was conducted on an ABI Prism 7000 sequence detection system using SYBR Green and the ΔCt (threshold cycle) method for quantification. The expression of GAPDH was used as an internal control. Studies using mice followed a protocol approved by the Institutional Animal Care and Use Committee of the University of Illinois, Chicago, IL. Data analysis was conducted using a paired Student’s t test with p < 0.05 considered statistically significant. The Prism software (version 4.0; GraphPad) was used. To determine whether TLR2 is a receptor for SAA, we prepared a TLR2-expressing cell line in HeLa, which contains few transcripts for the endogenous TLR2 (Fig. 1⇓A). Stable transfection of HeLa with a TLR2 cDNA expression construct resulted in a substantial increase in the TLR2 transcript (Fig. 1⇓A, middle panel) and abundant cell surface expression of TLR2 (Fig. 1⇓B). Functional characterization of the TLR2-HeLa cell line found a significantly increased NF-κB luciferase activity (p < 0.01) in response to SAA compared with mock-transfected HeLa cells (Fig. 1⇓C). The possibility that the observed activity was attributable to bacterial contaminants in the recombinant SAA preparation was examined. The concentration of PGN in the recombinant SAA was determined to be ≤0.8 ng/μg SAA protein, and the level of endotoxin was ≤0.54 endotoxin U/μg SAA protein. These contaminants, at concentrations found in the SAA used in this study (1 μM or 11.36 μg/ml), were unable to stimulate NF-κB activation in TLR2-HeLa cells (data not shown). The SAA samples were also treated with proteinase K (50 μg/ml for 1 h) or heat (95°C for 30 min) for protein degradation and denaturation. The proteinase K-treated SAA lost its ability to stimulate NF-κB activation, and heat-treated SAA lost its bioactivity by 95% in this assay (Fig. 1⇓C). In comparison, proteinase K and heat treatment did not significantly alter the bioactivities of the bacterially derived TLR2 ligands PGN and LTA. TLR2 is a functional receptor for SAA. A, RT-PCR analysis of TLR transcripts in mock (vector)- and human TLR2-transfected HeLa cells, and in THP-1 cells (positive controls). B, Histogram showing expression of TLR2 on the surface of TLR2-HeLa cells (open) compared with mock-transfected cells (filled) using an anti-TLR2 mAb and a FITC-conjugated secondary Ab. FL1-H, Fluorescence intensity. C, NF-κB luciferase (Luc) assays showing enhanced activity in TLR2-HeLa cells compared with mock-transfected cells after a 5-h stimulation with SAA (1 μM). The effect of SAA was abrogated by preincubation with proteinase K (PK) (50 μg/ml for 60 min) or heat treatment (95°C for 30 min). LTA and PGN (2 μg/ml each) were subjected to the same treatments and used as controls. D, The effects of overexpressed full-length (WT, wild type) TLR1, TLR2, TLR4, and TLR6 and their ΔTIR (DTIR) mutants on SAA-induced NF-κB luciferase reporter activity in TLR2-HeLa cells. The full-length and mutant TLRs were expressed at similar levels in 15–20% of the transfected TLR2-HeLa cells as determined using flow cytometry and Abs against the respective TLRs (data not shown). Shown in C and D are means ± SEM of triplicate measurements taken from three to five experiments that produced similar results. TLR2 is a class I transmembrane protein that contains an extracellular ligand binding domain (ectodomain), a transmembrane domain, and a cytoplasmic domain consisting of the Toll/IL-1 receptor/resistance (TIR) motif. Studies have shown that TLR2 forms heterodimers with TLR1 and TLR6 (27), which display different preferences for TLR2 ligands. The C-terminal TIR domain is conserved among TLRs and is responsible for TLR signaling (28, 29, 30). To assess the relative contribution of different TLRs to SAA signaling, full-length TLR1, TLR2, TLR4, and TLR6 or their TIR-deletion mutants (ΔTIR), were expressed in TLR2-HeLa and their effects on SAA-induced NF-κB luciferase reporter activity were determined. For each TLR, both the full-length construct and the ΔTIR mutant were expressed at similar levels in 15–20% of the transfected TLR2-HeLa cells (data not shown). 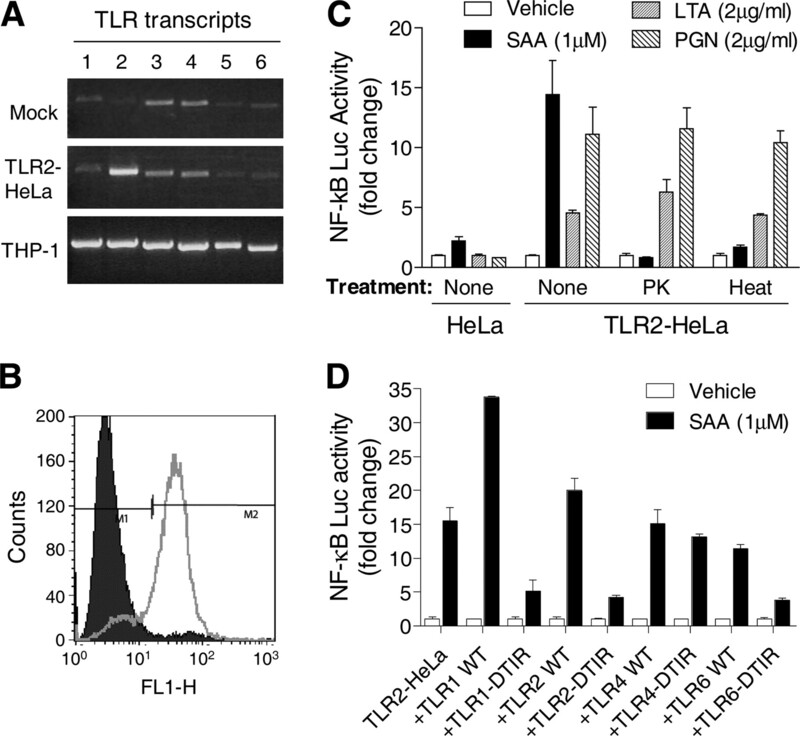 Exogenous expression of TLR1, but not TLR4 and TLR6, potentiated SAA-induced NF-κB luciferase activity (Fig. 1⇑D), suggesting that TLR2 and TLR1 form a functional heterodimer for SAA signaling. Expression of the ΔTIR mutants of TLR1, TLR2,or TLR6 caused a significant inhibition (p < 0.01) of SAA-induced NF-κB luciferase activity (Fig. 1⇑D). The inhibitory effect of the TLR6-ΔTIR mutant may result from sequestration of the adaptor molecules that interact with TLR2, although the full-length TLR6 apparently could not enhance SAA signaling. In comparison, expression of the ΔTIR mutant of TLR4 did not significantly affect SAA-induced NF-κB activation, suggesting that TLR4 is not a required component in this assay. 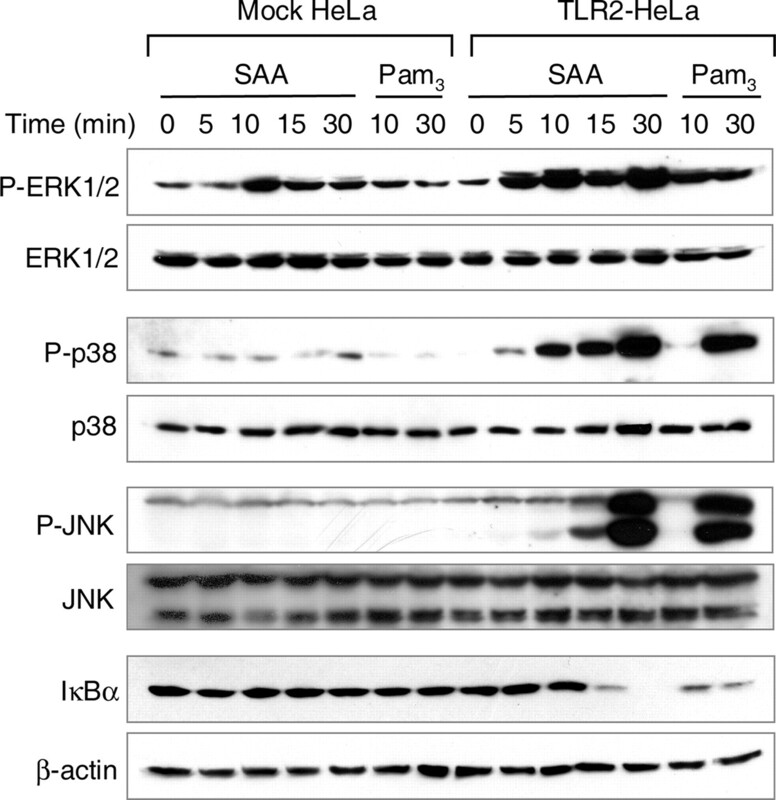 SAA at a relatively low concentration of 1 μM induced robust phosphorylation of the MAPKs ERK1/2, p38, and JNK in TLR2-HeLa cells compared with the mock-transfected cells that displayed little phosphorylation of p38 and JNK (Fig. 2⇓). In the mock-transfected cells, SAA but not Pam3CSK4 induced ERK1/2 phosphorylation at 10 min, which may result from activation of an endogenous SAA receptor, possibly an orthologue of the scavenger receptor SR-BI, CD36 and lysosomal integral membrane protein II (LIMP II) analogous-1 (23, 24). Also observed in TLR2-HeLa cells was SAA-stimulated IκBα degradation, known to result in NF-κB activation. No IκBα degradation was found in mock-transfected HeLa cells after SAA stimulation (Fig. 2⇓). These results suggest involvement of TLR2 in SAA signaling. SAA-induced, TLR2-dependent signaling in transfected cells. Serum-starved TLR2-HeLa and mock-transfected HeLa cells were stimulated with SAA (1 μM) or Pam3CSK4 (1 μg/ml) as indicated. Phosphorylation of ERK1/2 (P-ERK1/2), p38 MAPK (P-p38), and JNK (P-JNK) was determined by Western blotting using the respective anti-phospho-MAPK Abs. Total MAPK protein levels were shown below each blot. The level of cytoplasmic IκBα was determined by Western blotting using an anti-IκBα Ab, with the β-actin levels used for quantification and as loading controls. For each kinase and IκBα, a representative set of data from three experiments is shown. Treatment of the TLR2-HeLa cells with a neutralizing Ab against TLR2 significantly reduced SAA-stimulated NF-κB activation (p < 0.01, Fig. 3⇓A). To determine whether SAA interacts with TLR2, we conducted a solid-phase binding assay (Fig. 3⇓B) using a recombinant protein consisting of the TLR2 ectodomain fused to the Fc fragment of a mouse Ig (TLR2-Fc), which was purified from transfected CHO cells (Fig. 3⇓C, lane 1). 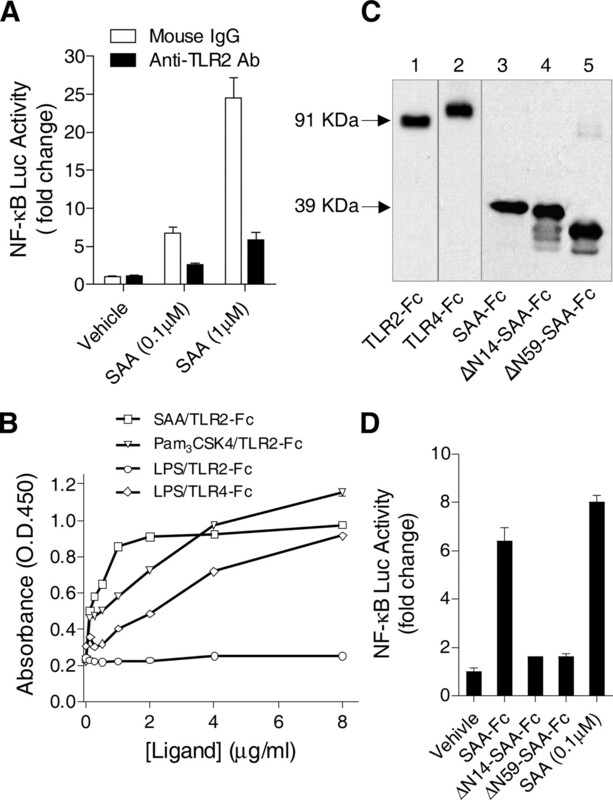 A dose-dependent increase in TLR2-Fc binding of the immobilized SAA was evident (Fig. 3⇓B). In a control experiment, TLR2-Fc was found to bind the immobilized Pam3CSK4, a known ligand of TLR2, in a dose-dependent manner. No significant binding of LPS was detected with TLR2-Fc, and the validity of the assay was confirmed with binding of the immobilized LPS (Fig. 3⇓B) by a TLR4 ectodomain-Fc fusion protein (TLR4-Fc; Fig. 3⇓C, lane 2). SAA interacts with TLR2. A, Inhibition of SAA-induced NF-κB luciferase activity in TLR2-HeLa cells by an anti-TLR2 Ab (2 μg/ml). Isotype-matching IgG was used at same concentration as a control. B, SAA binding to TLR2 was measured in an ELISA-like assay using a TLR2 ectodomain-Fc fragment fusion protein (TLR2-Fc). Increasing concentrations of SAA, Pam3CSK4, and LPS (from 0.0625 to 8 μg/ml) were immobilized to ELISA plates and incubated with a fixed amount (2 μg/ml) of the TLR2-Fc fusion protein in solution. Specific TLR2 binding was quantified through the Fc domain of the fusion protein using a HRP-conjugated anti-mouse IgG. The binding of immobilized LPS to TLR4-Fc was measured using the same method. Data shown are the means of triplicate measurements of absorbance at 450 nm, taken from one representative experiment. C, Western blots showing the full-length human SAA1 fusion protein (SAA-Fc; ∼39 kDa), the ΔN14-SAA-Fc and ΔN59-SAA-Fc mutants, and the TLR2-Fc (∼91 kDa) and TLR4-Fc proteins purified from transfected CHO cells and detected with Abs against human SAA1, TLR2, and TLR4, respectively. For each sample, ∼6 ng of the purified fusion protein was loaded in the gel. D, Induction of NF-κB luciferase (Luc) activity in TLR2-HeLa cells by medium without cells (vehicle) and 0.4 μg/ml each of SAA-Fc and two of the SAA deletion mutants fused to Fc (ΔN14-SAA-Fc and ΔN59-SAA-Fc). Recombinant human SAA (0.1 μM) was included for comparison. To further exclude the possibility that a trace amount of bacterial contaminants in the recombinant SAA preparation could cause the observed bioactivity through TLR2, we purified human SAA1 as a protein fused to the Fc fragment of a mouse Ig (SAA-Fc) from transfected CHO cells. Two SAA deletion mutants were also expressed as Fc fusion proteins. Although the yield was low, fusion proteins of the expected size were detected by Western blot analysis using an anti-SAA Ab (Fig. 3⇑C, lanes 3–5). The full-length SAA-Fc (0.4 μg/ml) displayed bioactivity in a TLR2-dependent NF-κB luciferase assay (Fig. 3⇑D, second column from left) that was comparable to the NF-κB luciferase activity induced by the commercial SAA (far right column; 0.1 μM or 1.136 μg/ml), indicating that the CHO cell-derived SAA-Fc is at least as potent as the commercial SAA. Deletion of 14 or 59 aa from the N terminus of mature SAA resulted in SAA-Fc fusion proteins (ΔN14-SAA-Fc and ΔN59-SAA-Fc, respectively) that lost ∼90% of their biological activity (Fig. 3⇑D). Similar results were obtained when the full-length SAA or its N-terminal 14- and 59-aa deletion mutants were expressed in E. coli as a GST fusion protein (data not shown), suggesting that the N-terminal segment of SAA, which is conserved among acute-phase SAA proteins in humans and mice (31, 32), is important for activating TLR2. We examined the roles of TLR2 in SAA-stimulated cytokine gene expression using bone marrow-derived macrophages from tlr2−/− mice. Based on real-time PCR analysis of selected cytokine transcripts, the SAA-induced expression of IL-12p40 (Fig. 4⇓A) and TNF-α (Fig. 4⇓C) was partially reduced in tlr2−/− mouse macrophages compared with wild-type macrophages. The SAA-induced expression of the two anti-inflammatory cytokines, IL-10 (Fig. 4⇓D) and IL-1R antagonist (IL1rn; Fig. 4⇓E) was completely abrogated in the absence of TLR2. Of note is that SAA induced TLR2-dependent expression of IL-23p19 (Fig. 4⇓B), which was consistent with our recent report that SAA is an endogenous ligand for IL-23 expression (25). IL-18, an IL-1 family cytokine, was also induced by SAA, but the induced expression was not affected by genetic deletion of tlr2. The variability in TLR2 dependency suggests the involvement of other receptors in SAA-induced cytokine gene expression (19, 24, 33). While this article was in preparation, Campa and colleagues reported that SAA stimulates macrophage production of NO in a TLR4-depedent manner that requires activation of ERK1/2 and p38 MAPK (34). Although it is unclear whether the TLR4 response to SAA can be reconstituted in transfected cells, this finding is intriguing and reinforces the notion that the physiological functions of SAA may be mediated through multiple receptors. Role of TLR2 in SAA-induced expression of selected cytokines. Tlr2−/− and wild-type (C57BL/6) mouse bone marrow-derived macrophages were stimulated with SAA (1 μM). At the indicated time points, cells were harvested for total RNA isolation. Real-time PCR analysis was conducted with oligonucleotide primers for respective cytokine transcripts IL-12 p40 (A), IL-23 p19 (B), TNFα (C), IL-10 (D), IL-1 receptor antagonist (IL-1rn; E), and IL-18 (F). The results were shown as means ± SEM from triplicate measurements. Data from one of the three representative experiments are shown. Using gain-of-function as well as loss-of-function approaches, we have shown in this study that SAA is a potent endogenous ligand that binds to TLR2 and stimulates the expression of selected cytokines. These findings suggest that SAA may be actively involved in innate immunity and inflammation. During the acute-phase response, SAA expression is induced by primary cytokines (IL-6, IL-1β, and TNF-α) and by bacterial products such as LPS (31). The secreted SAA in turn may enhance innate immune response to pathogens through its ability to stimulate inflammatory cytokine expression and attract neutrophils. SAA-induced IL-23 expression (25) may result in IL-17-mediated G-CSF secretion. In addition, our recent study has shown that SAA can induce G-CSF gene expression in mouse macrophages (26). These pathways are known to lead to neutrophil expansion (35), which can both enhance innate immunity and exacerbate inflammation. Elevation of SAA in acute-phase plasma and inflamed tissues has long been associated with inflammatory and autoimmune diseases including rheumatoid arthritis, atherosclerosis, and Crohn’ disease (8, 9, 11, 12). Our finding that SAA stimulates TLR2 activation suggests that increased local production of SAA contributes to the pathological changes seen in these inflammatory disorders. In rheumatoid arthritis, production of SAA by macrophages and fibroblast-like synoviocytes can exacerbate disease progression through increased neutrophil infiltration and neutrophil production of tissue-degrading enzymes (15, 16). The biochemical property of SAA and its low-level expression in normal tissues qualifies it as a damage-associated molecular pattern (36) that, when recognized by the host, can initiate tissue-controlled immune responses (37). Elevated SAA concentration has been found in atherosclerotic plaque (5). Given that TLR2 is a major pattern recognition receptor that was recently implicated in the development of atherosclerosis (38), our findings that SAA is an endogenous ligand for TLR2 imply that SAA production in atherosclerotic plaque may contribute to atherogenesis through persistent activation of TLR2 (39). Further investigation of the interaction between SAA and TLR2 is expected to shed new light on the mechanism by which SAA mediates host response to infection as well as noninfectious danger signals. We thank Dr. Richard Tapping (University of Illinois at Urbana-Champaign) for helpful discussions. ↵1 This work was supported by National Institutes of Health Grants AI040176 and GM066182 (to R.D.Y.). ↵3 Abbreviations used in this paper: SAA, serum amyloid A; CHO, Chinese hamster ovary (cell line); FPRL1, formyl peptide receptor-like 1; LTA, lipoteichoic acid; Pam3CSK4, (S)-[2,3-bis(palmitoyloxy)-(2-RS)-propyl]-N-palmitoyl-(R)-Cys-(S)-Ser-(S)-Lys4-OH, 3HCl; PGN, peptidoglycan; TIR, Toll/IL-1 receptor/resistance. Kushner, I., D. Rzewnicki. 1999. Acute phase response. J. I. Gallin, and R. Snyderman, eds. Inflammation: Basic Principles and Clinical Correlates 317-329. Lippincott Willams & Wilkins, Philadelphia. Hoffman, J. S., E. P. Benditt. 1982. Changes in high density lipoprotein content following endotoxin administration in the mouse. Formation of serum amyloid protein-rich subfractions. J. Biol. Chem. 257: 10510-10517. Kushner, I.. 1982. The phenomenon of the acute phase response. Ann. NY Acad. Sci. 389: 9-48. Jensen, L. E., A. S. Whitehead. 1998. Regulation of serum amyloid A protein expression during the acute-phase response. Biochem J. 334: 489-503. Meek, R. L., S. Urieli-Shoval, E. P. Benditt. 1994. Expression of apolipoprotein serum amyloid A mRNA in human atherosclerotic lesions and cultured vascular cells: implications for serum amyloid A function. Proc. Natl. Acad. Sci. USA 91: 3186-3190. Kumon, Y., T. Suehiro, K. Hashimoto, K. Nakatani, J. D. Sipe. 1999. Local expression of acute phase serum amyloid A mRNA in rheumatoid arthritis synovial tissue and cells. J. Rheumatol. 26: 785-790. Cunnane, G.. 2001. Amyloid precursors and amyloidosis in inflammatory arthritis. Curr. Opin. Rheumatol. 13: 67-73. Malle, E., F. C. De Beer. 1996. Human serum amyloid A (SAA) protein: a prominent acute-phase reactant for clinical practice. Eur. J. Clin. Invest. 26: 427-435. Fyfe, A. I., L. S. Rothenberg, F. C. DeBeer, R. M. Cantor, J. I. Rotter, A. J. Lusis. 1997. Association between serum amyloid A proteins and coronary artery disease: evidence from two distinct arteriosclerotic processes. Circulation 96: 2914-2919. Chambers, R. E., D. G. MacFarlane, J. T. Whicher, P. A. Dieppe. 1983. Serum amyloid-A protein concentration in rheumatoid arthritis and its role in monitoring disease activity. Ann. Rheum Dis. 42: 665-667. O'Hara, R., E. P. Murphy, A. S. Whitehead, O. FitzGerald, B. Bresnihan. 2000. Acute-phase serum amyloid A production by rheumatoid arthritis synovial tissue. Arthritis Res. 2: 142-144. Chambers, R. E., P. Stross, R. E. Barry, J. T. Whicher. 1987. Serum amyloid A protein compared with C-reactive protein, α1-antichymotrypsin and α1-acid glycoprotein as a monitor of inflammatory bowel disease. Eur J. Clin. Invest. 17: 460-467. Banka, C. L., T. Yuan, M. C. de Beer, M. Kindy, L. K. Curtiss, F. C. de Beer. 1995. Serum amyloid A (SAA): influence on HDL-mediated cellular cholesterol efflux. J. Lipid Res. 36: 1058-1065. Badolato, R., J. M. Wang, W. J. Murphy, A. R. Lloyd, D. F. Michiel, L. L. Bausserman, D. J. Kelvin, J. J. Oppenheim. 1994. Serum amyloid A is a chemoattractant: induction of migration, adhesion, and tissue infiltration of monocytes and polymorphonuclear leukocytes. J. Exp. Med. 180: 203-209. O'Hara, R., E. P. Murphy, A. S. Whitehead, O. FitzGerald, B. Bresnihan. 2004. Local expression of the serum amyloid A and formyl peptide receptor-like 1 genes in synovial tissue is associated with matrix metalloproteinase production in patients with inflammatory arthritis. Arthritis Rheum 50: 1788-1799. Vallon, R., F. Freuler, N. Desta-Tsedu, A. Robeva, J. Dawson, P. Wenner, P. Engelhardt, L. Boes, J. Schnyder, C. Tschopp, et al 2001. Serum amyloid A (apoSAA) expression is up-regulated in rheumatoid arthritis and induces transcription of matrix metalloproteinases. J. Immunol. 166: 2801-2807. Patel, H., R. Fellowes, S. Coade, P. Woo. 1998. Human serum amyloid A has cytokine-like properties. Scand. J. Immunol. 48: 410-418. Furlaneto, C. J., A. Campa. 2000. A novel function of serum amyloid A: a potent stimulus for the release of tumor necrosis factor-α, interleukin-1β, and interleukin-8 by human blood neutrophil. Biochem. Biophys. Res. Commun. 268: 405-408. He, R., H. Sang, R. D. Ye. 2003. Serum amyloid A induces IL-8 secretion through a G protein-coupled receptor, FPRL1/LXA4R. Blood 101: 1572-1581. Su, S. B., W. Gong, J. L. Gao, W. Shen, P. M. Murphy, J. J. Oppenheim, J. M. Wang. 1999. A seven-transmembrane, G protein-coupled receptor, FPRL1, mediates the chemotactic activity of serum amyloid A for human phagocytic cells. J. Exp. Med. 189: 395-402. Sodin-Semrl, S., A. Spagnolo, R. Mikus, B. Barbaro, J. Varga, S. Fiore. 2004. Opposing regulation of interleukin-8 and NF-κB responses by lipoxin A4 and serum amyloid A via the common lipoxin A receptor. Int. J. Immunopharmacol. 17: 145-156. Lee, M. S., S. A. Yoo, C. S. Cho, P. G. Suh, W. U. Kim, S. H. Ryu. 2006. Serum amyloid A binding to formyl peptide receptor-like 1 induces synovial hyperplasia and angiogenesis. J. Immunol. 177: 5585-5594. Cai, L., M. C. de Beer, F. C. de Beer, D. R. van der Westhuyzen. 2005. Serum amyloid A is a ligand for scavenger receptor class B type I and inhibits high density lipoprotein binding and selective lipid uptake. J. Biol. Chem. 280: 2954-2961. Baranova, I. N., T. G. Vishnyakova, A. V. Bocharov, R. Kurlander, Z. Chen, M. L. Kimelman, A. T. Remaley, G. Csako, F. Thomas, T. L. Eggerman, A. P. Patterson. 2005. Serum amyloid A binding to CLA-1 (CD36 and LIMPII analogous-1) mediates serum amyloid A protein-induced activation of ERK1/2 and p38 mitogen-activated protein kinases. J. Biol. Chem. 280: 8031-8040. He, R., L. W. Shepard, J. Chen, Z. K. Pan, R. D. Ye. 2006. Serum amyloid A is an endogenous ligand that differentially induces IL-12 and IL-23. J. Immunol. 177: 4072-4079. He, R., J. Zhou, C. Hanson, J. Chen, R. D. Ye. 2007. The acute-phase protein serum amyloid A induces G-CSF expression and granulocytosis. J. Leukocyte Biol. Suppl. : 44-45. (Abstr. 96). Medzhitov, R., C. Janeway, Jr. 2000. The Toll receptor family and microbial recognition. Trends Microbiol. 8: 452-456. O'Neill, L. A., A. G. Bowie. 2007. The family of five: TIR-domain-containing adaptors in Toll-like receptor signalling. Nat. Rev. Immunol. 7: 353-364. Uhlar, C. M., A. S. Whitehead. 1999. Serum amyloid A, the major vertebrate acute-phase reactant. Eur. J. Biochem. 265: 501-523. Lowell, C. A., D. A. Potter, R. S. Stearman, J. F. Morrow. 1986. Structure of the murine serum amyloid A gene family: gene conversion. J. Biol. Chem. 261: 8442-8452. Cai, H., C. Song, I. Endoh, J. Goyette, W. Jessup, S. B. Freedman, H. P. McNeil, C. L. Geczy. 2007. Serum amyloid A induces monocyte tissue factor. J. Immunol. 178: 1852-1860. Sandri, S., D. Rodriguez, E. Gomes, H. P. Monteiro, M. Russo, A. Campa. 2008. Is serum amyloid A an endogenous TLR4 agonist?. J. Leukocyte Biol. 83: 1174-1180. Seong, S. Y., P. Matzinger. 2004. Hydrophobicity: an ancient damage-associated molecular pattern that initiates innate immune responses. Nat. Rev. Immunol. 4: 469-478. Matzinger, P.. 2007. Friendly and dangerous signals: is the tissue in control?. Nat. Immunol. 8: 11-13. Mullick, A. E., P. S. Tobias, L. K. Curtiss. 2005. Modulation of atherosclerosis in mice by Toll-like receptor 2. J. Clin. Invest. 115: 3149-3156. Tobias, P. S., L. K. Curtiss. 2007. TLR2 in murine atherosclerosis. Semin. Immunopathol. 30: 23-27.